Sound Radix, the company behind plug-ins such as Auto-Align, POWAIR and SurferEQ, announce Auto-Align Post, a new plug-in that speeds up and simplifies the process of getting location mics to be in phase. Auto-Align Post is an AAX AudioSuite plug-in for Avid Pro Tools, designed to automatically correct the delay and comb-filter phase issues occurring when mixing a recording of multiple moving microphones, such as in the case of a shoot set-up using a boom microphone in addition to actor’s lavalier microphone or multiple on-set microphones. Until now, phase/time aligning multiple moving microphones was a tedious, time- consuming job that often required several ear-twisting days to complete. However, with Auto-Align Post, those days may be over. The new algorithm builds upon Sound Radix's proprietary technology used in their Auto-Align plug-in. And, according to Sound Radix, it makes phase/time correction of a moving multi-microphone recording for an entire film a matter of a few clicks and a short coffee break. The plug-in can correct for delays of up to 100ms, equating to distances of around 112 feet/34 metres. Impressively, dynamic mode enables continuous phase/time correction for moving actors or cameras. Meanwhile, static mode enables fixed phase/time correction for stationary microphones. 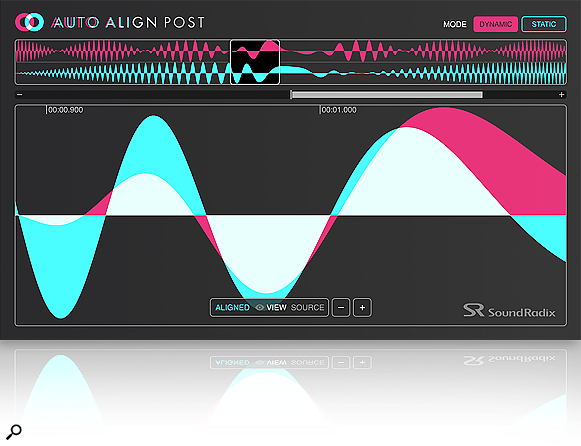 Auto-Align Post will cost $299 although Sound Radix are offering it at a special introductory price of $249 until September 30. During this offer period those owning a registered copy of Auto-Align before August 21st 2018 can purchase Auto-Align Post at a special discount price of $149 ($199 thereafter).